Calling all seafood lovers! A new seafood restaurant has opened its doors in Media One Hotel! You know me, when it comes to seafood, I'd be the first in line especially when the restaurant has a unique concept. 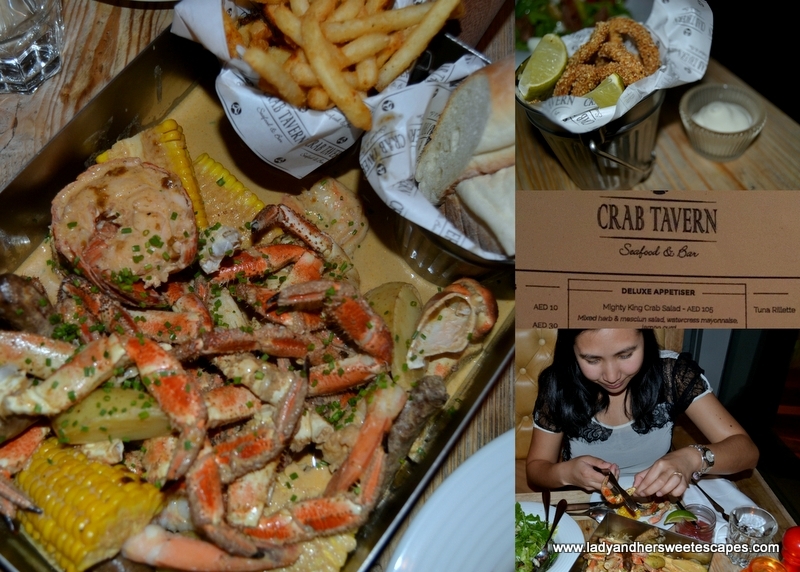 I was excited when I first heard about the opening of Crab Tavern Seafood and Bar which was first launched in London. Although "crab" is very much highlighted in its name and menu, Crab Tavern has an American surf and turf concept, and that simply means it's a delight for both carnivores and seafood fans! Crab Tavern is tucked in the 9th floor of Media One Hotel. Ed and I went on a Saturday evening and we were quite surprised with the chic and lounge-like ambiance from the ground floor to the foyer in the 9th floor, and even inside the elevator itself! In the 9th floor, we stepped on a huge signage that led to a rustic restaurant and bar. We were happily welcomed by two friendly staff at the reception area. As soon as they were done validating our reservation, we were immediately assisted to a diner booth with a nice view of Dubai Media City. I'm not sure, but bet it's a good vantage point for Palm Jumeirah during the day. The dining area is perfect for us who wanted a relaxed dinner. The atmosphere is homey with a little bit of chilled vibe because of the music coming from the bar. Crab Tavern's menu can drive a seafood lover crazy. I was ecstatic and at the same time confused on what to order. There's nothing wrong with the food selections, it's just me and my two wide eyes. I'm curious with almost everything; hence I asked about almost everything! I'm thankful that the staff assigned to take our orders is one of the most patient human beings on earth! Ed and I went with his recommendations, and I'm glad to say he didn't fail us. For starters, we had the Surf and Turf salad which can be ordered as an appetizer, as a main and in table size to share portion. It's a simple Nicoise salad that was taken to a higher level by tender flank steak and succulent jumbo shrimps! When I said I like to have something light as I want to make a huge room for the main course and dessert, our server recommended Fried Black Pepper Squid. I like it! It's so different from the battered calamari that I know. The squid rings are wrapped in a special extra-crunchy coating and comes with a lemon aioli dip on the side. I don't drink, but I was very much intrigued with Crab Tavern's cocktail list and the fact that it was the Happy Hour, so I asked for a margarita that is bizarrely named Crab Jar! No, there's no crab extract in it (ewww), just a perfect blend of raspberry, tequila, triple sec, lemon and lime! And here come's the star! For the main course, Ed and I decided to share Crab Tavern's best selling West Coast Bucket Boil. In a rectangular pan are crab claws, mussels, lobster, ratte potatoes, merguez sausage and sweet corn... all smothered with a creamy brown sauce! It came with fries and bread in tin buckets. Without further ado, we grabbed the claw crackers and started the fun. Out of all in the pile, I loved the lobster claws the most because I got a substantial amount of meat in one crack! The crab claws required a lot of hard work and it's quite frustrating to only have tiny bits of crab meat after all the effort. When I got tired, I settled with the lamb sausages which I surprisingly love as the spicy meaty taste stood out from the delicate seafood flavor. After half an hour of cracking and scooping out crab meat, we happily gave up! Our attentive server gave us wet tissues, and then the dessert menu! Dessert! My favorite part of the meal! Crab Tavern's dessert menu is not that extensive, but the options are pretty much gratifying. I chose Pecan & Maple Tart, and the husband who is not fond of sweets nodded while hoping it wouldn't be too sweet for his liking. Much to his delight, it was just right for him.. and for me as well. It is loaded with pecan, lightly sweetened, and topped with two mini scoops of Bourbon ice cream. You had me at CRAB, haha. Currently drooling over those photos.